The Hawaiian giant known by his adopted Japanese name of Musahimaru Koyo (he took Japanese citizenship in 1996) has got to be the heavyweight champion of "cute". A sumo wrestler who has succeeded in being incredibly consistent and inconsistent at the same time, "Moose" or "Maru" is one of the most popular sumo wrestlers of his day. His shy and retiring personality belies his enormous power and size - he is 1.91m tall and weighed over 230kg at his heaviest. Fiamalu Penitani was born in Samoa and moved to Hawaii at the age of 10. He played football and was a Greco-Roman wrestler in high school. He was recruited by former Olympic gold-medal wrestler Date Jiichiro and came to Japan at the age of 18. He joined the Musashigawa Beya (stable) although the oyakata (stablemaster) was somewhat reluctant to accept a foreigner with no Japanese language ability. This was despite the fact that fellow Hawaiian Konishiki was a successful Ozeki (champion) at the time. He made his debut in September 1989 under the name Musashimaru (the first two kanji characters of the name, musashi, being shared with that of his oyakata) and had his first appearance in the professional Juryo ranks in July 1991. After that, he made rapid progress and was promoted to the top Makuuchi division in November and the upper Sanyaku ranks the following May. But it was almost another two years before he was promoted to the rank of Ozeki and that's when he really put the brakes on. It's not that he wasn't winning. Indeed he went on to set a record of 52 consecutive basho (tournaments) without a make-koshi (losing record). But at that time he couldn't seem to put together the consecutive yusho (championships) that are necessary for promotion to Yokozuna (Grand Champion). Musashimaru's laid back style and seeming lack of killer instinct led many to predict that he was typically Hawaiian and would never be promoted to Yokozuna. There had never been a foreign rikishi (wrestler) promoted to the highest rank. Konishiki, Akebono and his stablemaster before him Azumazeki had made it as far as Ozeki and some sumo purists even thought that that was how far they should be allowed to go. Akebono finally broke through that barrier in 1993 but Musashimaru had to wait until July 1999 for his hour of glory. He had given up drinking the year before and shed some 10kg as a result. The new leaner, meaner Musashimaru won back-to-back basho in March and May to ensure his promotion and he went on to win a total of four basho that year. But Musashimaru's true character still restricted the level of success that he was able to achieve. Nervous in front of the camera, he fumbled his speech and couldn't stop shaking during his Yokozuna promotion ceremony. He continued to perform with hugely varying levels of consistency and ended his career with a respectable but not intimidating 12 yusho under his belt (compared to 22 for rival Takanohana). Having sat out most of the preceding year with a recurring wrist injury, he retired in late 2003. Even during his decline, he had the ability and raw power to keep from having a losing record (unthinkable for a Yokozuna, who would be expected to retire if faced with such a possibility). But his lack of power in his wrist, one of his strngest weapons, and lack of mobility put him in a similar situation to that faced by Konishiki in his later days - usually able to win in a short head-to-head bout but unstable in a long match or when attacked from the side. 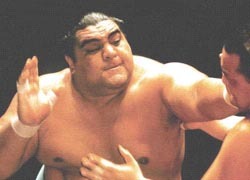 Unlike his compatriots Konishiki, who went on to become a TV commercial pitchman, and Akebono who took up the brutal sport of K-1, this gentle giant is likely to spend his retirement years quietly. The Sumo Association site has profile pages for current rikishi and some historical data.